Becky Lewis has been working at Art + Commerce, one of the most powerful and prestigious image making representative agencies in the world, for over 23 years. As Grant Scott discovered when speaking with her, there are few people as well informed in the industry to stake a case for the agent and explain how the role of the agent has changed over the past decades. 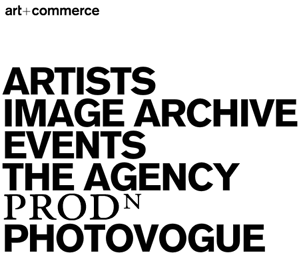 Today Art + Commerce is arguably one of the most powerful and prestigious agencies in the world representing photographers such as Steven Meisel, Nick Knight, Tim Walker and Ellen von Unwerth amongst others, as well as the estates of Robert Mappletorpe and Guy Bourdin. Art + Commerce was founded in the early 1980s by Anne Kennedy, Jim Moffat and Leslie Sweeney whose concept when creating the agency was at the time simple and unique. They wanted to create an agency capable of supporting image-makers within the realms of both art and commerce at a time when there was renewed interest by artists in working within the editorial environment. Since then the agency has grown to represent photographers, stylists, creative directors, hair and make up artists and one illustrator for assignments, special projects and image licensing, as well as offering casting location and bespoke services. Their projects include editorial and advertising assignments as well as longer-term independent projects in film, photography and other media. Grant: You must have seen a lot of changes over the years viewing the professional photographic industry from an agent’s perspective. Becky: It’s interesting, I met with an old colleague in Los Angeles recently who was with Annie Leibovitz as a studio manager for many years before coming to Art + Commerce as an agent and we were talking about how dramatically things have changed. The work cycle that used to exist via Fedex, fax, messengers and hard portfolios, one thing has segued into the other. Personally in respect of workflow, the changes have all resulted in a vast improvement. We can now get images to the right people globally. Grant: International barriers have been broken, it is no longer the case that New York, Milan, London and Paris exist as separate markets and centres for photography. Becky: Actually, we have always been very internationally based as a company, much of our advertising work in the Nineties was based in Germany, Italy and Paris and our editorial was based out of Italy and Paris. For us the big change has been the introduction of Eastern Europe and China as markets. Grant: Despite these commercial changes you have stayed true to a core group of Art + Commerce photographers. Becky: Yes, we are definitely slow moving with our roster, we don’t add many people and we don’t lose a lot of people. The idea of the agency has always been to build relationships and we get involved in their exhibitions and book projects as well as their commissioned work. Grant: You did grow the number of artists you represented a few years ago and then reduced the number. Was that a reaction to the commercial climate at the time? Becky: A lot of agents have reduced the number of photographers they represent over the last few years in response to the economic climate. Speaking personally, I think that as advertising agencies roles changed around 2000, our role changed as well. Instead of making five phone calls for a project, I began making 50 to 100 phone calls, clients began coming to us directly outside of ad agencies and those that were with ad agencies became more involved in the process. So all of a sudden it became very clear that in order to create opportunities for the photographers we represented we had to concentrate on fewer and therefore represent less. I think that this is a direct response to the web, people are finding us now who never would have before and working directly with the client means a whole different way of putting deals together. Grant: How did things change for ad agencies? Becky: Their clients no longer just wanted print media or TV media, they wanted social media, events, celebrity participation and branded content as well. Over the space of five to 10 years from 2000 onwards the clients started to look at a photographic shoot as an opportunity to create not just one product but a dozen products. They wanted moving footage, interviews, you name it, they wanted it. So as the agencies were creating new opportunities for their clients they then turned to us to create the content for those opportunities. Grant: Client expectation has grown dramatically over the last 10 years. Becky: Yep, it has now got to the point on set where it has become a struggle between the client, the model, the stylist and the hair and make up in which everyone is trying to brand themselves. It becomes a question of who is controlling the content and there will be signs around the shoot featuring a Twitter icon with a band through it to control the way in which people communicate from the shoot and the kind of material they are allowed to release. So that the client’s ownership of the material is maintained and the photographer’s rights to his images are protected. Grant: Which brings us to the moving image. Becky: You know a couple of years ago I met with an art buyer and she said that it really is the ‘wild west’ now. Meaning that with moving image, everyone was waiting to see how the advent of the RED camera would affect the broadcast divisions and if the moving image would be able to be channeled through broadcast divisions within the ad agencies, as that provided them with a huge area of profit because of their mark ups on production. If it’s not running through the broadcast division but it is running through the print division, then who gets that mark up? You have clients getting involved in that discussion and you certainly have photographers getting involved because the traditional broadcast model for rights does not apply with moving image created in this way and the usage rights agreed for print do not apply. So who owns the material? And what can be done with it when the usage agreements have expired? A whole new set of questions has been launched, which a lot of people who would have previously had ready answers for did not have any answers for. Grant: Art + Commerce has always worked with the highest level of client and photographer. Do you think that your continued success has been due to that client base and level of work, whilst the mass photographic market has suffered, particularly within editorial? Grant: It was a much smaller industry. Becky: Much smaller. The idea when the agency started was for the partners through their friendships with Robert Mapplethorpe and Annie Leibovitz to create opportunities for photographers to gain exposure for their work and to create work for them. At the time you did work for many but kept that work quiet and we created a shift, which meant that photographers would do their most beautiful work and then lend their name to the product, to help brand and create that product through an affiliation with it. It was a way of working that only fit a few photographers and there were only a few clients who could afford it. Which meant that we didn’t represent many photographers at that time. Grant: As an agency Art + Commerce had and has a reputation for being tough to deal with from a client perspective because of your incredibly high standards, which as a photographer is exactly how I would want my agent to act. Becky: I met Horst P Horst years ago, I had lunch with him just before he died and he was talking about the inequities of having his archive controlled by Condé Nast. If you signed a pay cheque from Condé Nast, on the back it said that all of the rights to your images were controlled by Condé Nast forever. Photographers assumed that they had no rights, and as long as they were paid a day rate they were content. We helped with the shift away from that thought process. You don’t want to be a 60-year old artist with nothing left to your name without your life’s work. You need to own it and establish your ownership of it. Grant: Just as the industry has changed over the years so has the role of the agent. Handling contracts for example has become a potential minefield for agents. Becky: I used to get contracts, which in comparison to what I get now were extremely simple. I used to know what to look out for but now when I get sent a contract I rarely attack it myself, they are too subtle, too clever. They are beyond me, so they have to go straight to our team of lawyers. Grant: It used to be the case that photographers saw the agent’s role primarily as a provider of work, but I think that agents are now looking for photographers who already have successful careers. This, combined with the closure of a lot of the small English agencies, has made it harder than ever to get taken on by an agent. Becky: This is such a huge subject to discuss, we could spend six hours on this alone, but I do think that expectation in relation to reality has long been disconnected. First of all, the small English agencies always had a well deserved reputation for finding extremely talented creative artists, but the role of the agent in fashion versus commercial work is very different. With fashion photographers certain agents can do certain things for certain photographers, but I think that Art + Commerce’s strength is in working with photographers who know where they stand in the marketplace and in the history of photography. A young photographer that doesn’t understand this will have expectations that are just too large. I always ask why they want an agent and what do they think that they are going to get by having an agent that they can’t achieve on their own. I know it’s easier to have someone working for you but to be effective in the industry you have to identify who you are, what your work is about and the person who is going to be selling your work has to understand these things completely. Also, as a young photographer you need to be meeting stylists and art directors who you will be coming up through the ranks with, you need to have those relationships and experiences, they should not be had by the agent. Grant: It’s a small business and you will be in it for a long time. Grant: And if you are willing to put in the hard work required. Grant: Where are you and Art + Commerce at the moment with the moving image? Becky: I’m personally so excited by the moving image; I think we have got so far away from the electricity, excitement and energy of what’s unknown in a photo shoot. Everything is seen on a monitor, retouched and controlled but moving image seems to be closing this space and is once again providing happy accidents and happenings. I also think as a consumer and a very healthy consumer of fashion and beauty I find that the moving image makes a product far more appealing because I think less about the product and more about the narrative. Which I can then embrace. ‘Click to buy’ really is just steps away and I expect that we will be interacting with the moving image soon to provide a more rewarding experience. But I also love print and I may be an optimist but I believe that the growth of the moving image helps clearly define the value of print that has been beautifully executed. The print then becomes the guider for the moving image experience and sums up the brand experience. Hopefully advertising can now start to become an explanation mark rather than the whole dictionary. Grant: Do you think that the terms photographer and filmmaker are going to be replaced with the term image maker? Becky: I don’t know if every still photographer is going to be interested in or be able to create moving image or that every filmmaker is going to want to see there work captured as a still. Grant: Do you think that the moving image will become the dominant genre of the two in the near or distant future? Becky: I don’t but you can get back to me in five years time and we can see if I’m right. I think we are in a period of time at the moment where we are maxing out on digital information and so the idea of people depending completely on the moving image as a way to tell stories would be incredibly short sighted. I’m also not sure how effective the moving image is as a sole selling tool, ultimately we do have to turn the screen off at some point. Grant: The reality I think is that a lot of photographers will want and have to move between the two genres. But the new generation of image makers coming through will only have known the option of doing both. Becky: Yes, well that is when it is going to become interesting because these people are comfortable living completely online. Grant: Where do you think the relationship between the photographer and agent is going to go and is there still a role for an agent to fulfill? Becky: I think it’s a changing role because there is so much more available to a photographer now, so that they really could represent themselves in a nuts and bolts way. But the role of the agency should be to amplify who you are and your work and to bring in clients that would be outside of your sphere, understanding or imagination. The real importance of an agent today is to find opportunities, which are not readily available we have to create them. You have to be super informed and aware of what’s happening to do that. The more conduits you have for more information you have the more successful you are going to be. Grant: It’s about being pro-active. Becky: Very pro-active and active in ways that really don’t seem to have an immediate value. Grant: It would be interesting for us to speak in five years time, because five years ago if we had had this conversation most of what we have spoken about would never have occurred to us as being relevant or acheivable. Becky: Exactly and I’m quite prepared that the photography we will talk about then will exist as a tattooed chip under our arms. Technology is forcing us to act, think and create in different ways. I think it’s very exciting. Grant: So do I, we just need to remain open minded.